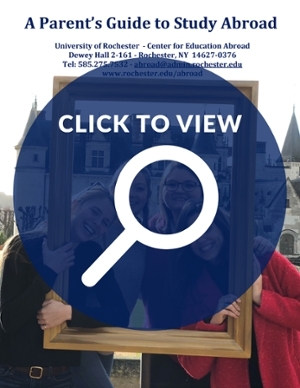 Th e University of Rochester is committed to international education and to preparing students to take their place in the global political and economic community. This commitment ensures enthusiastic support for all students who choose to enhance their education by studying abroad. To learn more about the education abroad opportunities available to your student, please read our Parent Guide to Study Abroad. We also suggest checking out our scholarship page. Making sure your child has everything they need to stay safe and healthy while abroad is important to us. That’s why we make sessions on health and safety part of our mandatory pre-departure training. See the Health Care Guide and Checklist for Student Travelers. All University of Rochester students are covered under the AXA Assistance plan, serviced by Mercer. There is no additional cost for this benefit. For more information, see the travel insurance and assistance. Through good preparation, we help make their transition to living overseas as smooth as possible. With the student’s travel plans well underway, it's time to plan your visit in their “adopted” country. Are you thinking of visiting your son/daughter but feel overwhelmed with the planning process? No worries –let an accredited Vacation Specialist help! Via Mondo Travel will assist parents and their family members to create a vacation package geared around their child's program overseas as well as find the unique day trips and activities that fulfills everyone's wish list. We leave plenty of time to meander around to showcase the city's splendor and we also incorporate family activities to explore the area gems together. Take advantage of this opportunity and discover Europe, Asia and Australia together. Combine countries, itineraries or create your own package. These are the moments that every parent cherishes. Via Mondo welcomes you to peruse the possibilities.